MIAMI – Norwegian Cruise Line's "exciting and exotic new itineraries" for the brand’s Fall/Winter 2016/2017 deployment, bring the world to guests who want to explore new sights while experiencing the freedom and flexibility that only Norwegian Cruise Line can offer. Norwegian offers guests new destinations and new ports to choose from in 2016 and 2017, including cruises to Asia onboard Norwegian Star, with itineraries departing from Istanbul, Dubai, Singapore, Hong Kong, Sydney and Auckland—marking the line’s return to the Asia and Australia regions for the first time since Norwegian Wind Fall/Winter 2001-2002 and first-ever visits to The Gulf and India. Norwegian Epic will continue to spend her summers in Europe and return to the US in the fall as Norwegian’s newest and largest ship to homeport in Port Canaveral, offering three-, four- and seven-day Eastern and Western Caribbean and Bahamas itineraries. Exploring South America by sea will now be more accessible than ever with Norwegian, with a number of itineraries ranging in length from seven to 20 nights, with embarkations in Buenos Aires, Argentina; Santiago (Valparaiso), Chile; and Rio de Janeiro, Brazil. Norwegian Spirit will return to homeport in Europe year-round, sailing through the Eastern and Western Mediterranean with departures from Barcelona, Istanbul and Venice. In addition, Norwegian Jade will now sail seasonally in the winter months from Tampa to the Eastern and Western Caribbean, while Norwegian Jewel will sail two new 14-day Panama Canal sailings from Los Angeles and Miami in February 2016 and two in February 2017. In the fall of 2016, Norwegian Cruise Line will cruise to the Far East for the first time since fall/winter 2001-2002, with the recently renovated Norwegian Star sailing to the region for several unique itineraries that also feature first-ever visits to The Gulf and India. Norwegian Star will continue to spend her summer 2016 months cruising the Baltic Capitals from Copenhagen, Denmark. After her journey through the Western Mediterranean, Norwegian Star will depart on October 31, 2016 from Istanbul on the brand’s first voyage to the Gulf region through the Suez Canal for a 20-day Eastern Mediterranean and The Gulf itinerary with stops in Ephesus (Kusadasi), Turkey; Rhodes, Greece; overnight in Haifa, Israel; Port Said, Sharm El Sheikh and Safaga, Egypt; Aqaba, Jordan; Salalah and Muscat, Oman; and an overnight in Dubai, United Arab Emirates. On November 20, 2016, Norwegian Star will sail a 21-day Journey to the East from Dubai, United Arab Emirates to Singapore, featuring the brand’s first visit to India with an overnight in Mumbai and stops in Goa (Mormugao), Mangalore and Kochi (Cochin). Additional ports of call include Fujairah and Abu Dhabi, United Arab Emirates; Muscat and Khasab, Oman; Colombo, Sri Lanka; Phuket, Thailand; Penang, Langkawi and Kuala Lumpur (Port Klang), Malaysia; and Singapore. Throughout December 2016 and January 2017, Norwegian Star will do a series of 11- and 14-day sailings in Southeast Asia, departing from Singapore and Hong Kong respectively. Norwegian Star’s 11-day Southeast Asia itineraries departing from Singapore on December 11, 2016 and January 5, 2017 feature ports of call in Ko Samui and an overnight in Bangkok (Laem Chabang), Thailand; Ho Chi Minh City (Phu My) and Nha Trang, Vietnam; Sanya and Hong Kong, China. Guests who sail on the ship’s 14-day Southeast Asia itinerary from Hong Kong on December 22, 2016 will celebrate the holidays with calls in Kaohsiung, Taiwan; Hanoi (Ha Long Bay), Da Nang, and Ho Chi Minh City (Phu My), Vietnam; Sihanoukville, Cambodia; an overnight stay in Bangkok (Laem Chabang) and a day visit to Ko Samui, Thailand; and Singapore. On January 16, 2017, Norwegian Star will sail a 21-day Southeast Asia and Australia itinerary from Hong Kong, China to Sydney, Australia. Ports of call include Nha Trang and Ho Chi Minh City (Phu My), Vietnam; Bangkok (Laem Chabang), Thailand; Singapore; Bali (Benoa) and Komodo, Indonesia; Darwin, Cairns, Airlie Beach, and Brisbane, Australia. Norwegian Star will sail a 12-day Australia and New Zealand sailing on February 6, 2017 from Sydney, Australia to Auckland, New Zealand. Ports of call for this adventure down under include Melbourne and Burnie, Australia; and Dunedin, Akaroa, Wellington, Napier and Tauranga, New Zealand. Norwegian Star will also sail a 19-day Australia and New Zealand thrill-filled itinerary from Auckland, New Zealand to Singapore departing February 18, 2017. Ports of call include: Bay of Islands, New Zealand; Sydney, Brisbane, Airlie Beach, Cairns and Darwin, Australia; and Komodo and Bali (Benoa), Indonesia; and Kuala Lumpur (Port Kelang), Malaysia. Norwegian Star will begin her journey back to the West with an 18-day Southeast Asia and India sailing from Singapore to Dubai, departing March 9, 2017. Ports of Call include Kuala Lumpur (Port Klang), and Penang, Malaysia; Phuket, Thailand; Colombo, Sri Lanka; Kochi (Cochin), Mangalore, Mumbai and Goa (Mormugao), India; Muscat and Khasab, Oman; Fujairah and Abu Dhabi, United Arab Emirates. Rounding out her season in the Far East will be a 20-day Eastern Mediterranean and The Gulf sailing from Dubai, United Arab Emirates through the Suez Canal to Venice, Italy departing March 27, 2017. Ports of call on this Western-bound journey include Fujairah, United Arab Emirates; Muscat and Salalah, Oman; Aqaba, Jordan; Safaga and Sharm El Sheikh, Egypt; an overnight in Haifa, Israel; a stop in Iraklion, Crete, Greece; Dubrovnik, Croatia; and finally, an overnight stay in Venice, Italy. After more than a year in Europe, Norwegian Epic will return to Florida in November 2016 and will become the line’s largest ship to homeport from Port Canaveral. Norwegian will offer Freestyle Cruising at its finest aboard Norwegian Epic with a series of Eastern and Western Caribbean and Bahamas itineraries ranging in length from three, four, six and seven days—a sure opportunity to fit any schedule or itinerary preference. Norwegian Epic’s seven-day Eastern Caribbean itinerary will be a beach-lover’s paradise with stops in Tortola, British Virgin Islands; St. Thomas, US Virgin Islands; and Great Stirrup Cay, Bahamas. Guests can choose to soak-up the sun or opt for an adventurous land-based activity on Norwegian Epic’s Western Caribbean itinerary, featuring stops in Cozumel, Mexico; George Town, Grand Cayman; Ocho Rios, Jamaica; and Great Stirrup Cay, Bahamas. Norwegian Epic will offer guests who may not have the time to get away for a week-long vacation the perfect opportunity for a quick escape in January and March 2017 with three- and four-day Bahamas itineraries with stops in Nassau and Great Stirrup Cay. Norwegian Jade will replace Norwegian Star and homeport from Tampa from November 2016 through April 2017 and sail a seven-day Western Caribbean itinerary departing on Sundays to Cozumel, Mexico; Costa Maya, Mexico; Roatan (Bay Islands), Honduras; and Norwegian’s new Caribbean destination experience, Harvest Caye, Belize. In addition, Norwegian Jade will also sail two eight-day Western Caribbean holiday sailings in December 2016. Guests aboard these two cruises will enjoy the holidays under the sun with ports of call in Cozumel, Mexico; Costa Maya, Mexico; Roatan (Bay Islands) Honduras; Harvest Caye, Belize; and Santo Tomas de Castilla, Guatemala. Norwegian Jade guests can explore further into the Caribbean with two 10-day and two 11-day Eastern Caribbean cruises from Tampa. Marking the first time Norwegian has offered sailings longer than one week to the Caribbean from Tampa, Norwegian Jade’s 10-day Eastern Caribbean itinerary departing January 15 and March 19 will visit Key West, Florida; Tortola, British Virgin Islands; St. John’s, Antigua; Philipsburg, St. Maarten; and San Juan, Puerto Rico. Norwegian will call in Santo Domingo, Dominican Republic for the first time aboard Norwegian Jade’s 11-day Eastern Caribbean itinerary departing January 25 and March 29; additional ports of call include Cozumel, Mexico; George Town, Grand Cayman; Ocho Rios, Jamaica; St. Thomas, U.S. Virgin Islands or Tortola, British Virgin Islands; and San Juan, Puerto Rico. Norwegian will continue to offer a four-ship deployment in Europe during the summer of 2016. Norwegian Spirit will replace Norwegian Epic as the brand’s year-round European ship, while Norwegian Star will sail the Mediterranean and Western Europe in the fall of 2016 en-route to the Far East. Norwegian Star will begin her journey south with a 14-day Western Europe sailing from Copenhagen, Denmark to Barcelona, Spain departing on September 28, 2016. Guests will have the freedom and flexibility to taste, touch, shop and feel the flavors of Europe with ports including Oslo, Norway; Rotterdam, Netherlands; Brussels/Bruges (Zeebrugge), Belgium; Paris (Le Havre) and Bordeaux (Le Verdon), France; Seville (Cadiz), Valencia, and the line’s first call in Gijón, Spain; as well as a call in Lisbon, Portugal. Norwegian Star will sail an 11-day Classic Mediterranean itinerary from Barcelona to Istanbul in October 12, 2016. Highlighting some of Europe’s most sought-after destinations including Palma, Majorca, Spain; Marseille, France; Rome (Civitavecchia), Naples and Taormina (Sicily), Italy; Athens (Piraeus) and Mykonos, Greece; and overnight in Istanbul, Turkey. Norwegian will return to the Holy Lands for the first time since 2013 with one eight-day Eastern Mediterranean and Holy Lands sailing round-trip from Istanbul aboard Norwegian Star departing October 23, 2016. Guests will marvel at the spiritual and natural wonders of the region with stops in Ephesus (Kusadasi), Turkey; overnight in Haifa, Israel; Alanya, Turkey; and Rhodes, Greece. Norwegian will offer two additional opportunities for guests to visit this incredible region, with two 11-day Eastern Mediterranean and Holy Lands sailings aboard Norwegian Spirit. The voyages will depart November 28, 2016 and April 12, 2017 on a port-packed itinerary from Venice to Istanbul with three overnight stops in Venice, Italy; Haifa, Israel; and Istanbul, Turkey. In addition, the itinerary will feature ports of call in Zadar, Croatia; Iraklion (Crete), Mykonos and Rhodes, Greece; and Ephesus (Kusadasi), Turkey. for guests to embark a ship in the Turkish city. Ports of call vary by sailing depending on length but include Zadar, Croatia; Iraklion, Crete, Athens (Piraeus) and Rhodes, Greece; Ephesus (Kusadasi), Turkey; Naples, Florence/Pisa (Livorno), Palermo, Sicily and Rome (Civitavecchia), Italy; Monte Carlo, Monaco; Palma, Majorca, and Valencia Spain; Marseilles, France; and Valletta, Malta. On December 27, 2016 and March 12, 2017 Norwegian Spirit will sail a 10-Day Canary Islands and Morocco itinerary. Her stops will include Tangier, Morocco; Las Palmas and Santa Cruz de Tenerife, Canary Islands; Funchal, Madeira; and Granada (Malaga) and Alicante, Spain. In addition to Norwegian’s previously scheduled Panama Canal deployment featuring two 14-day cruises in February 2016, the line has added two new 14-day Panama Canal sailings from Los Angeles and Miami on Norwegian Jewel, on February 5 and February 19, 2017 respectively. The mirrored itineraries feature ports of call including Cartagena, Colombia; Puntarenas, Costa Rica; Corinto, Nicaragua; Puerto Quetzal, Guatemala; Acapulco and Cabo San Lucas, Mexico; and will feature a bucket-list item: a daytime transit through the wondrous Panama Canal. As previously announced, Norwegian Sun will return to South America for the winter season in 2016 and 2017. 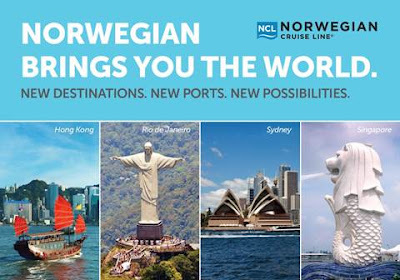 During this season, Norwegian will offer a variety of sailings through South America with departures from new homeport Rio de Janeiro, Brazil, as well as from Santiago (Valparaiso), Chile; and Buenos Aires, Argentina. Guests will experience adventures great and small with a South America sailing aboard Norwegian Sun. Norwegian will offer 10-day South America itineraries departing from Buenos Aires, Argentina and Rio de Janeiro, Brazil in December 2016, February and March 2017, where guests can soak up the vibrant South American culture with ports of call including an overnight stay on select sailings in Buenos Aires, Argentina; stops in Montevideo and Punta del Este, Uruguay; and Sao Paolo (Santos), Ilha Grande and Buzios, Brazil, with an overnight stay in Rio De Janeiro. Those looking to experience the majesty of the holidays at sea can do so aboard Norwegian Sun’s South America 14-day Buenos Aires Round-Trip sailing departing December 23, 2016. The holiday sailing is sure to bring “boas festas,” happy holidays, to all aboard with an overnight stop in Buenos Aires, Argentina; and the best of Brazil with stops in Sao Paolo (Santos), Ilha Grande, Buzios, Angre dos Reis and an overnight stay in Rio de Janeiro; along with Montevideo and Punta del Este, Uruguay. Norwegian will offer four South America 15-day itineraries between Santiago (Valparaiso) and Buenos Aires, Argentina. The East-bound itineraries depart from Santiago (Valparaiso) on January 21 and March 9, 2017 while the West-bound depart from Buenos Aires, Argentina on February 22 and April 10. These spectacular journeys feature calls in Punta Arenas, Puerto Chacabuco and Puerto Montt, Chile; Stanley, Falkland Islands; Montevideo, Uruguay; Puerto Madryn and Ushuaia, Argentina; with an overnight in Buenos Aires, Argentina. During these eastbound cruises, guests will also cruise the Patagonic Channels, majestic Chilean Fjords, sail the famous Strait of Magellan; Beagle Channel and the spectacular Cape Horn. Those who may only have one week for a quick South American getaway can opt for Norwegian Sun’s South America seven-day Buenos Aires, Argentina to Rio de Janeiro, Brazil sailings on February 5 and March 24, 2017. This weeklong itinerary offers a snap shot of Eastern South America with ports of call in Sao Paolo (Santos) and Ilha Grande, Brazil; and Montevideo and Punta del Este, Uruguay. Norwegian Sun will make her journey back to the Northern Hemisphere with a South America 20-day Santiago (Valparaiso), Chile to San Francisco sailing departing April 25, 2017. Guests on this voyage can experience a myriad of cultures with ports of call in Central America’s quaintest cities and opt for a shore excursion to the mystical Machu Picchu from Arica, Chile. Ports of call for on this northern-bound adventure include Coquimbo and Arica, Chile; Lima (Callao) and Trujillo (Salaverry), Peru; Puntarenas, Costa Rica; Corinto, Nicaragua; Puerto Quetzal, Guatemala; and Puerto Chiapas, Huatulco and Cabo San Lucas, Mexico. Guests can also choose to extend their South American exploration with a Cruisetour, providing an unparalleled opportunity to explore this region’s culture and spectacular destinations such as Machu Picchu, Iguazu Falls and Easter Island. Seasonally, Norwegian also continues to offer three ships in Alaska, four in Europe, two in Bermuda, as well as a variety of exciting South America; Bahamas and Florida; and repositioning cruises. Norwegian will also continue to offer its unique inter-island Hawaii cruises year-round on Pride of America from Honolulu. Norwegian’s short Bahamas itineraries on Norwegian Sky will continue to sail from Miami year-round, and will offer an all-inclusive experience featuring free premium beverages on all sailings in 2016 and beyond. For further information on Norwegian Cruise Line, visit www.ncl.com, follow us on Facebook, Twitter, and Instagram @Norwegiancruiseline, Pin us on Pinterest, watch us on YouTube, or contact us in the U.S. and Canada at 888-NCL-CRUISE (625-2784).